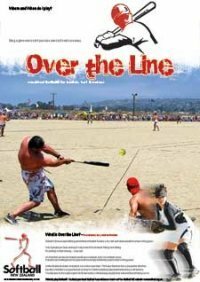 OTL is a variation of Softball stemming from the beaches of San Diego, California. A fast, fun packed game. OTL is ideal for the beach but can also be set up on grass or indoors. An Over the Line court comprises of a triangle and an open ended rectangle marked by ropes or lines on the ground. The Line is fair territory. Everything other than the triangle and fair territory is foul territory. The objective for the batter is get a hit into fair territory without being caught; no bases are physically run; three outs and the half inning is over, the fielding team can start batting as soon as the last is taken from offensive team. The recommended Over the Line ball is ‘Lite Flight’ available from Exclusive Sports Goods. Download a full set of rules and scorecard. Download an Over the Line poster (11mg), create your own event!